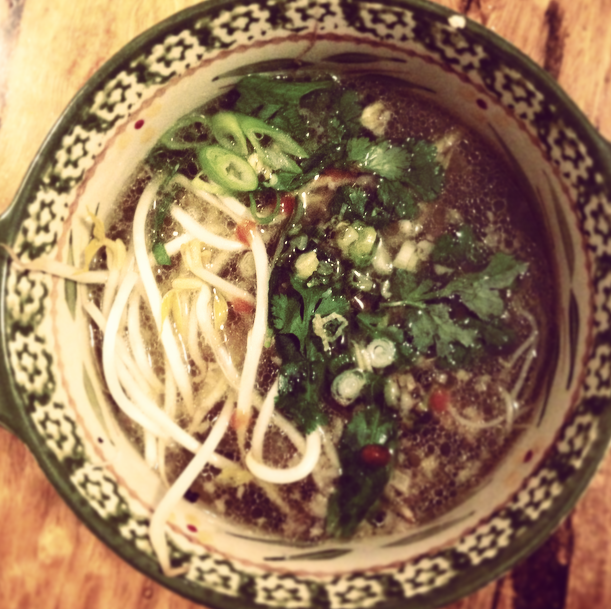 Beef Pho soup is a Vietnamese classic. It is a light fragrant and nutritious broth and is perfect for warming the body during winter. This recipe can be made over a few days for a really intense flavor. Pre heat oven to 220ºC / 200ºC fan forced oven. Place bones, onion, carrot and celery in large baking dish and roast uncovered until browned (45min). Drain excess fat and place bones and vegetables in large pot with water, spices and fish sauce. Boil uncovered for minimum 1 1/2 hrs (longer if possible). Strain and remove beef and shred. Discard fat and vegetables and allow to cool. Once cool remove fat layer from pot. Return broth to heat and add shredded beef and soy sauce. Heat noodles in bowl of boiling water and stand for 5-10 min until tender.